Zee Tree Route is a well-bolted face climb located to the right of the Dike route and ascends an independent line for 3 pitches, after which it joins House Calls and Boche-Dope in a left facing book which leads to the base of the crack pitch of the Dike Route. The climbing is fairly varied. The first pitch, which is the most interesting, starts at a two bolt anchor just where the angle steepens and ascends a short slightly steep section of knobs (2 bolts with old leeper-style hangers), crosses glacier polish (2 bolts) to a miniature roof. Step over the roof (1 bolt) and pass a small tree growing in a solution pocket (Zee Tree). 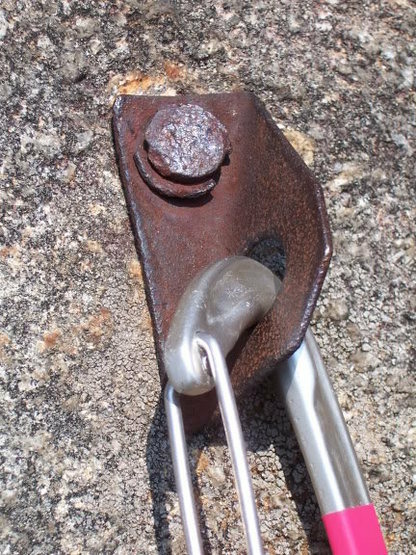 The pitch originally ended at the tree, but to reduce impact on the fragile tree, the route now passes the tree on the right and ascends (5 bolts) to a comfortable stance and a two bolt anchor. This pitch is a full 165 feet. The angle slackens above and the climbing eases as well. The second pitch is easy (5.5?) face climbing past 3 bolts to a another two bolt anchor. The final pitch is also easy face climbing , though interesting as the angle varies. It heads up and right past 2 bolts, then straight up and ends in a left facing book. This belay requires gear, medium nuts to medium friends. To exit, climb up the left facing book and belay near the base of the crack pitch on the Dike Route. Either climb this crack (pro to #4 friend) and rappel the east end of Pywiak, or walk off to the west (not recommended). Alternative descent per user Dillbag: Escape left prior to the final (5.7 crack) pitch. It is an easy 5.0 traverse (60ish feet) to the bolted rap anchors at the top of the Dike Route. One short rappel followed by two long (two 60 meter ropes required) rappels will deliver you to the 3rd class base. This is helpful if it begins to rain or if necessary to make a quick exit. The route was put up in good style. A mix of eighteen 5/16 and 3/8 inch bolts were placed by hand, on lead, from the ground up, though not in a continuous push. Two others were "filled in" while seconding after leading though originally, to eliminate uncharacteristic runout sections. 5.7 crack at the end is super fun! Looking down at Deanna on Zee Tree. From the second belay on Zee Tree. Hmmm....I'm pretty sure that there are not any 1/4" bolts on Zee. I don't recall there even being any 5/16" bolts (maybe just a couple?). I think most of the bolts on there are 3/8". Perhaps Greg Barnes will see this post and comment, but my recollection is that he told me that those 5/16" rigs that you see all over California are actually pretty truck. That is not to say that the bolts on Zee don't need replacing (though I don't remember being nervous and I am pretty whiny about rusty old buttons), but there are probably many other candidate routes that need the hardware more than Zee does. Also, I think that the route description needs to be updated, because there definitely aren't any Leeper hangers at the anchors on Zee any longer. You ever climb this route or are you just guessing about the bolts? I looked on SuperTopo and someone said the same thing I did about the bolts. I don't want to get too far down in the weeds as to what they are. I can't tell from the button-head whether they are 1/4" or 5/16", a 1/16 of an inch difference. The point is they are old rusty spinners that should be replaced on a highly travelled route. And as of July 2011 they were there. This is approximately what they look like. Yeah, that is definitely a Leeper, but that is not an anchor bolt from Zee. Is it possible that either: (a) you wandered a bit off route and clipped that thing; or (b) that was an intermediate bolt between two good bolts that during a rebolting effort was just left in place? I remember the bolts being pretty new and the some of the pictures posted above seem to corroborate my recollection. Moreover, if you look up Zee Tree on the ASCA website you will notice that the bolts on Zee Tree have indeed been upgraded. No leepers on this route. Only buttonhead I remember (w/ good SMC hanger) that wasn't replaced is the most tightly spaced bolt on the first pitch - didn't expect to see that one so close to the bolt above and below it (which is why they didn't replace it). The walk off, which are well marked by cairns actually goes to the FRONT and a bit climbers left of zee tree, ending near the tiny-sometimes-dry-creek at the base. We were here on Saturday, June 18, 2016, and simply could not find the bolts. I feel fairly certain that we were in the right place (not like the poster just above), and we climbed up and down the start several times. Climbed on June 25. All the bolts are still there. They are just hard to find. 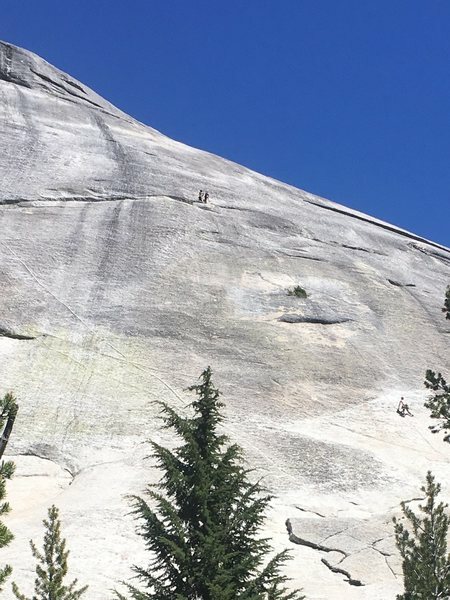 Single climber around the first anchor, and two climbers at the second anchor. The single climber is by the first anchor, and the other two climbers are at the second anchor. Bolts at bottom for first pitch had tat on it when we climbed this route a couple days ago, which really helped to find the start. A common occurrence on this route is to not see your next bolt until you continue climbing or when it's right in front of you. The beginning 3-4 moves off the bottom of the first pitch are surprisingly spicy. This route is worth doing because of the first pitch and last pitch of Dike Route. Build your anchor at the top of pitch 4 before doing the traverse to the left. Placements are much better there than those you'll find at the base of the crack.